In these times of high prices and questionable food sources, are you thinking of starting your own backyard garden? Expert gardener Kevin Mennegerode teaches our audience the basics of organic vegetable gardening. Don't be afraid! It can be fun and easy! 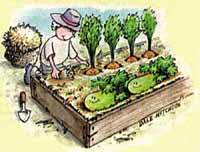 With humor and a clear, concise style, Kevin explains how to get started, where to get seeds or seedlings, and where to go for additional help and information when you need it. This summer you could be enjoying the freshest salads you've ever eaten - from your own backyard!